A quick sketch in art class led Donna Pooley to create a mural which is being painted on the third floor of Spiva Library. The new mural can be found on the third floor of Spiva Library. 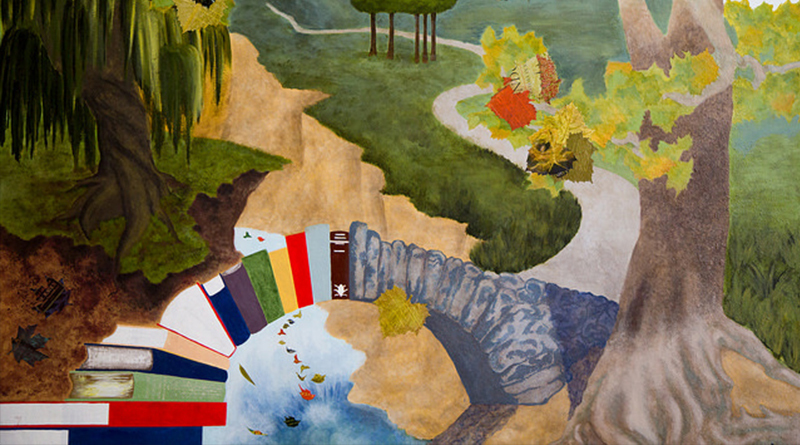 The mural is a landscape featuring a bridge made of books, and trees with leaves made from pages of books. “I just wanted to express how I value libraries,” said Pooley, a clerk at the library, who created the sketch during a mural class taught by Kyle McKenzie. The mural is not yet complete. Pooley and students Gayle O’Neal, Zainab Almuhanna, Morgan Leeper, Veronica Pickett and Carla Rea are working on it as time allows. It was the first time she has worked on a mural, and it was her love for learning that led her to pursue the project. “I hope it inspires students to take art classes,” she said.